Pink Kat (shown): "The freshest smelling perfume and oil essences of gardenia, rose, wild ylang ylang and neroli lend their properties of love from the heart and earthy sexiness. Pink Kat is innocent, sensual and alluring all at once." Abbey Rose: "Imbued with clarity and balance, this essence has rich notes of fig, rose, bergamot, lavender, neroli and a bit of grapefruit." Chen Xi (first light of dawn): "This scent has the Zen sensibilities of simplicity and happiness. Light and fresh, wild ginger, red and yellow mandarin, lemongrass, spearmint and a hint of lily make this subtle, delicate perfume a transformative timeless classic." Genie In A Bottle: "Seductive, potent, scents of exotic oils like jasmine, vanilla, organic frankincense, bittersweet chocolate, black and organic black pepper are just a few of the essences that infuse magic into this bottle." Hail Merri: "Complex and alluring, Hail Merri carries the frequencies that inspire sublime grace and beauty. Vetivert, oak moss, violet leaf, rosewood, tuberose and a touch of sweet pea inspire this lofty elixir of restoration, regeneration and renewal." Whyte Rabitt: "Quixotic and playful, this essence never smells the same twice on your skin. Mercurial by nature Whyte Rabitt embodies notes of linden blossom, banana, basil, wild blue cypress, calendula, and blackberry." The Trance Essence line fragrances are sold in 60 ml Eau de Parfum ($103), 3.75 ml Perfume Oil ($52) or matching soy candles. A set of samples of the Perfume Oils is available for $35. The fragrances are available from the tranceessence website or at first-in-fragrance in Germany. I found the fragrances in Munich at http://www.suendhaft.com as well. Thanks! Hopefully they'll be at more US stores soon. mmm, they actually sound fun and probably tasty. but expensive for the probable equivalent of a fling. Hey thanks — will look for the Vogue. No civet in the Pink Kat? For shame! I read it as, “Pink Rat.” Did a double-take. It sounds pretty. But perhaps there is — there don't appear to be any base notes at all in that list, right? Pink Rat! We need a perfume called Pink Rat. 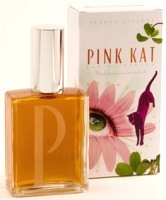 Pink Kat sounds great: Gardenia, ylang ylang, neroli, rose …. fab. But I can't get over the surreal art of the box and then the drugstore ordinariness of the bottle. I like the box! Bottle cap is not great though. I like the box, too, and I like the giant “P” on the bottle, but the cap does look cheesy. I would imagine that a small house does not have extra funds to spend on every last little detail like caps, so I am willing to forgive. It is true — the fact that they even customized the bottles w/ the initials is more than you can expect from most indie houses. I'll forgive.